The ocean water, once warm and inviting, was becoming cold and daunting. Floating only helped for a limited time until a wave would crash over my face, up my nose, in my mouth and eyes and ears. I tried to swim the back stroke but wasn’t even sure which direction to go. I was getting tired and those lights I’d seen from the ship were now invisible at water level. Fortunately I’d still not run into a shark. Really I’d run into nothing at all. Once again I was back to “don’t panic”, over and over again in my mind like that song you hear once on the radio, one line sticking in your head, and you hum it constantly until even you are sick of it. The only things I could reliably see were water and stars. It did seem the waves were not as big as before, but that could have been wishful thinking. As I tried floating again and studying the stars, I remembered playing a game the night before. It was late and I amused myself by finding a prominent constellation and deciding what it looked like. A lizard, perhaps. No, more like a glittering seahorse! The ship was headed north and that constellation was to port side, so it was to the west. West was land, and west was the direction I wanted to go. 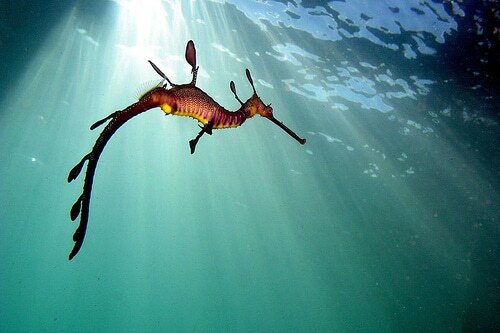 I studied the night sky looking for the Australian seahorse, silently praying I would see it soon. I’ve never been quite so happy to see a group of stars in my life as the second I spotted that seahorse. I’d found it! I knew which direction to head. Fortunately I was a strong swimmer but this ridiculous escapade of mine was pushing my stamina to the limit. I just kept heading for the seahorse, alternating backstroke and breast stroke, floating to catch my breath in between swimming spurts. My legs ached and my breath came in gasps. The muscles in my arms hurt, my eyes burned and I was shaking from the cold. I have no idea when I finally made it to shallow water. I was on the verge of blacking out and I knew I was dehydrated. How ironic to be surrounded by water and yet need water more than anything. Perhaps it was akin to not recognizing happiness and instead jumping into a swirling black abyss. The shoreline was rocky but the stones and boulders were low and I emerged from the water to reach them. I saw no lights or other sign of mankind, but I do remember hearing a bird caw, sort of like a crow or more probably a gull. I guessed that dawn was close but I didn’t care. I pulled myself up on a large rock and lay down, facing the stars, those lovely stars that showed me the way. I closed my eyes and wondered if I’d ever see the cruise ship again. I felt so differently about it now. I’d been rash and silly to risk my life jumping off of it, and I missed it as a newborn baby must miss its mother’s womb. I sensed something near me and I opened my weary eyes. Light was peaking out from the other side of the world and the tentative sun illuminated the water before me with a gentle warm glow. I lay expectantly and watched as a brilliantly colored, dolphin-sized head emerged before me. Except it wasn’t a dolphin. It was orange and green and red and yellow with emerald vine-like appendages draping from its face. Its snout was long and its eyes were a soft brown that sucked me into its gentle psyche. I thought back to the ship’s lecturer telling us about creatures that lived on the Great Barrier Reef, and he showed us a photo of a Weedy Sea Dragon, sort of an Australian seahorse on a multicolored acid trip. He’d said they were quite rare these days, and I didn’t think they were nearly as big as the beautiful creature before me now. He continued to gaze at me with those soulful eyes and then beckoned with his snout. I jumped back into the shallow green water and followed that technicolor flowing tail as it headed for deeper water, diving into the rays of light now punctuating the cerulean sea. area . Searching in Google I at last came across this site. that I’ve found precisely what I needed. am an aspiring bllg writer but I’m still new to everything. Tremendous things here. I’m vdry happy to see your article. Thank yoou a lot and I’m looking forward to touch you. I provide credit and s?urces back to your ?ebpage? provide here. Please let me know if this ?k with you. Appreciate it! Sometimes we can’t figure out why we are gaining weight or. (i. Hygiene and attention to yourself as part of the Diabetes treatment.